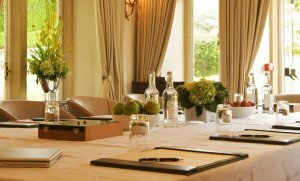 A selection of discrete and private meeting rooms offer choice and flexibility at Lords. Our meeting rooms near Cheltenham feature specialist Wi-Fi access points designed to cope with multiple simultaneous connections. The principal meeting room, the Garden Room, offers plenty of natural daylight, Wi-Fi access, screen and flip chart, with further equipment available. 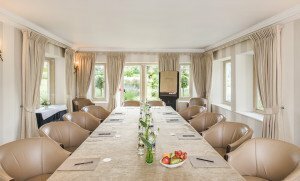 The Garden Room can accommodate a maximum of 30 delegates and our clients often tell us that it is one of the most inspiring meeting rooms in the Cotswolds. Our 8 acres of garden provide a perfect opportunity for team building events and our coordinator will be happy to put you in touch with suppliers or make arrangements. There are also a number of locations within a short drive that offer activities such as clay pigeon shooting, falconry, paint balling and archery. We’ll happily put you in touch. Download our Meetings Guide here. 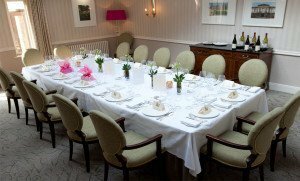 Dinner will be served in a private dining room; for parties of 8 or more guests we do ask that a set menu is decided upon. All of our 26 bedrooms are individually furnished and decorated to a luxurious standard and provide a haven in which to rest and recuperate ready for another day in the boardroom which commences with an excellent full English breakfast served in your private dining room from 8am.